Dynamite is a commercial explosive used mainly for demolition and mining. Invented in 1866 by Alfred Bernhard Nobel (1833-1896), it is more accurately described as the packaging of nitroglycerin, a highly poisonous explosive liquid, or other volatile compounds such as sensitized ammonium nitrate. Dynamites can be packed in measured charges, transported easily, and, with the proper detonator, exploded safely. Because a dynamite explosion creates a "cool flame," which is less likely to ignite methane and coal dust mixtures present in mines, dynamites are frequently used in coal mining operations. Alfred Nobel, his father Immanuel, and younger brother Emil began experimenting with nitroglycerin near Stockholm in 1862. Discovered by Italian chemist Ascario Sobrero in 1846, nitroglycerin was highly unstable and difficult to handle, and accidental explosions were not uncommon. One such accident killed Emil, among others, at a plant in 1864. Despite the personal tragedy, Alfred continued his work with this dangerous liquid, working on a boat in the middle of a lake before conducting his experiments in a factory. In 1866 he discovered that mixing nitroglycerin with kieselguhr (diatomaceous earth) stabilized and reduced the volatility of the explosive. Diatomaceous earth is formed by the fossil remains of a single-celled plankton called diatoms, and the result is an absorbent material which "soaks up" the nitroglycerin. Alfred named the product "dynamite"—derived from the Greek "dynamis" meaning "power"-—and received a patent for the process in 1867. Nobel went on to develop several other explosives and propellants, including smokeless powder ballistite. He held over 355 patents and his considerable fortune provided the financial basis for the Nobel Prize, which is awarded "to those who, during the preceding year, shall have conferred the greatest benefit on mankind." Dynamite is classified as a Secondary High Explosive, which means a detonator of Primary or Initiating High Explosive (mercury fulminate, for example) is utilized to set off the main charge. Dynamite is considered a commercial explosive, as opposed to TNT (trinitrotoluene) explosives, which are considered military munitions explosives. The first large scale use of dynamite for construction purposes was in the creation of the Hoosac Tunnel, completed in 1876. Dynamite manufacturing can be described as the safe packaging of nitroglycerin, a highly poisonous explosive liquid. roofs and walls and extensive security systems. Other important precautions include thorough inspection systems which insure correct mixing, grading, packaging, and inventory control. Employees are also highly trained to work with the explosives, and special health precautions are required. Exposure to nitroglycerin commonly produces throbbing headaches, although an immunity to the toxic effects can develop. Interestingly, nitroglycerin is also used in medicine to treat some forms of angina and other ailments. In the body, it acts as a vasodilator and relaxes muscle tissue. The process begins with the compound liquid such as nitroglycerin (explosive oil), a "dope" substance, and an antacid. Ethylene glycol dinitrate, composing approximately 25-30% of the explosive oil, is used to depress the freezing point of the nitroglycerin. This allows the dynamite to be safely used at low temperatures. In fact, nitroglycerin in a semi-frozen state with both liquid and solid present is actually more sensitive and unstable than either frozen or liquid state alone. In that semi-solid state, nitroglycerin is extremely dangerous to handle. 1 The explosive oil is carefully added to a mechanical mixer, where it is absorbed by the "dope," which can be either diatomaceous earth (now no longer used), wood pulp, sawdust, flour, starch, and/or other carbonaceous substances and combinations of substances. 2 Approximately 1% antacid such as calcium carbonate or zinc oxide is added to neutralize any acidity present in the dope. The mixture is monitored carefully and when the correct ingredient level is attained, the mixture is ready for packaging into the various forms. 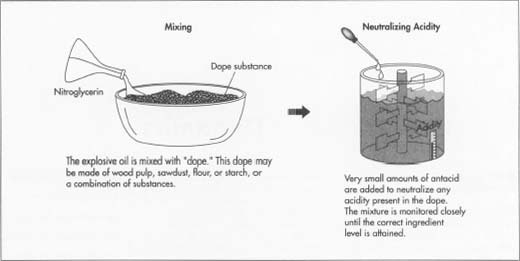 This process produces what is termed "straight dynamite," in which the dope does not contribute to the explosive strength of the dynamite. For example, 40% straight dynamite contains 40% nitroglycerin and 60% dope; 35% straight dynamite contains 35% nitroglycerin and 65% dope. In some cases, sodium nitrate is mixed with the dope, which acts as an oxidizer and gives additional strength to the explosive. The appearance of dynamite typically resembles a round cartridge approximately 1.25 inches in diameter and 8 inches long. The paraffin enclosure protects the dynomite from moisture and, being a combustible hydrocarbon, contributes to the explosive reaction. 1.25 inches (3.2 cm) in diameter and 8 inches (20 cm) long. This type is produced by pressing the dynamite mixture into a paper tube sealed with paraffin. The paraffin enclosure protects the dynamite from moisture and, being a combustible hydrocarbon, contributes to the explosive reaction. Dynamite can also exist in many other forms, from smaller sizes of cartridges for specialized demolition work to large 10-inch (25 cm) diameter charges that are used for large strip mining operations. Regulations limit the length of these big charges to 30 inches (76 cm) and the weight to 50 pounds (23 kg). Dynamite is also available as a bag powder and in a gelatinized form for underwater use. Dynamites are also made using other substances besides nitroglycerin. For instance, replacing a larger portion of the explosive oil with ammonium nitrate can increase the explosive strength of the dynamite. This form of dynamite is referred to as ammonia dynamite. Accurate dynamite strength measurement and testing by detonation assure safe performance of the explosive. The relative strength of dynamite is graded by comparison to straight dynamite and by the percentage of weight of the explosive oil. For example, ammonia dynamite is compared to straight dynamite and is graded accordingly. Fifty percent ammonia dynamite is equal in explosive strength to 50% straight dynamite. In this instance, the "50%" reflects the strength comparison rather than the explosive content. After manufacture and batch testing of the dynamite, it is dispensed to the job site under strict transportation and storage regulations. The following brief example is one of many scenarios for the proper application of dynamite. It must be noted that no one but a certified blasting expert with the correct procedures and equipment should ever attempt to detonate dynamite. In this example, a rock formation must be blasted to make way for a construction project. The first step in the blasting procedure is to determine the size of the charge by various means, including charts, calculations, and the blaster's experience. Close examination of the affected area and surrounding terrain is made to determine the safe zone. Signs are placed a minimum of 1000 feet (305 m) outside the safe zone to warn the public of the blasting. Radio transmitters are turned off and locked to prevent accidental firing of the electric detonators. The charge is then withdrawn from the magazine and transported to the blast site using closed and secure trucks. The detonators are brought to the job site in a separate vehicle. The charges are unloaded and placed into the blast holes drilled in the rock formation. They slide into the blast hole by air pressure or by tamping with wooden or plastic rods. The blaster takes great care that the leadwires to the detonators are shorted together until all charges have been placed. This provides a short circuit path for the wiring which prevents accidental ignition. Only the blaster is allowed to make the final electrical connections to the main firing switch. During this time, a 5-foot (1.5 m) gap in the wiring immediately ahead of the main switch is used as a "lightning gap," another safety practice to eliminate the possibility of static electricity setting off the charges. Once all of the preparation for the blast is complete, a warning horn sounds a one-minute series of blasts prior to the detonation signal. At this time, the final connections to the firing switch are made. At one minute to detonation, a series of short horn blasts are sounded. The blaster then unlocks the main switch and detonates the charges. After the explosion, all electrical circuits to the blasting equipment are once again locked into the safe positions, and the area is inspected for misfired charges and general safety. A prolonged horn blast signals the all clear. Explosives manufacture and use contribute some measure of hazardous waste to the environment. Nitroglycerin produces several toxic byproducts such as acids, caustics, and oils contaminated with heavy metals. These must be disposed of properly by neutralization or stabilization and transported to a hazardous waste landfill. The use of explosives creates large amounts of dust and particulate from the explosion, and, in some cases, releases asbestos, lead, and other hazardous materials into the atmosphere. Also, uncontrolled or improperly calculated explosions may rupture nearby tanks and pipelines, releasing their contents into the environment as well. Since their development in the 1950s, advanced forms of plastic explosives and shaped charges have replaced dynamite. These explosives are now referred to as blasting agents, since their stability is improved and require a more powerful primer to detonate. One of the most common blasting agent is ANFO, or ammonium nitrate and fuel oil. ANFO is readily available, considerably cheaper than dynamite, and can be mixed on site. 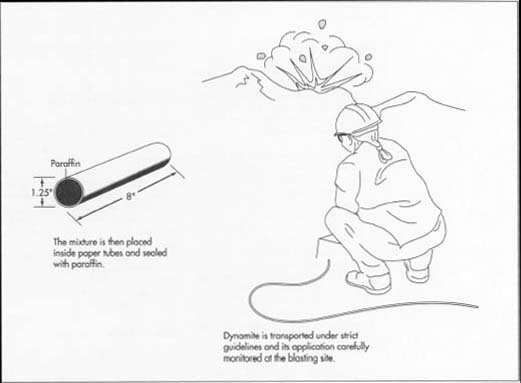 However, concrete demolition crews requiring relatively small charges still use dynamite as the blasting agent. Grady, Sean M. Devices of Controlled Destruction. Lucent Books, 1994. Keller, J.J. OSHA Safety and Compliance Manual, 1992. Lewis, Richard, Sr. Sax's Dangerous Properties of Industrial Materials, 8th ed. Van Norstrad Rienhold, 1993. Meyer, Rudolf. Explosives. VCH Publishers, 1992. Porter, Samuel J. Explosives and Blasting Agents, Fire Protection Handbook. 15th ed., 1981. Sickler, Robert A. Explosive Principles: An Essential Guide to Understanding Explosives and Detonations. Paladin Press, 1992.
send to manufacturers of this products.we would like to know more about dynamite.